Black Pudding with Coarse Cheese and Horseradish | Is Life a Recipe? I think that looks pretty damned good! I’d order that if I saw someone next to me have it served up. And it was so so damned tasty! Woof woof! I just got back from The Philippines for a conference. As usual crappy food on the plane, so a little peckish what can I eat? A quick rummage in my food fridge, and I spot the stuff I bought last week at my mate Chris’s, The Cheese Shop @ Joo Chiat. And what did I create, well I created Black Pudding with Coarse Cheese and Horseradish. ALL items were bought from his joint. I am so happy now, knowing that this is going to taste so so good. 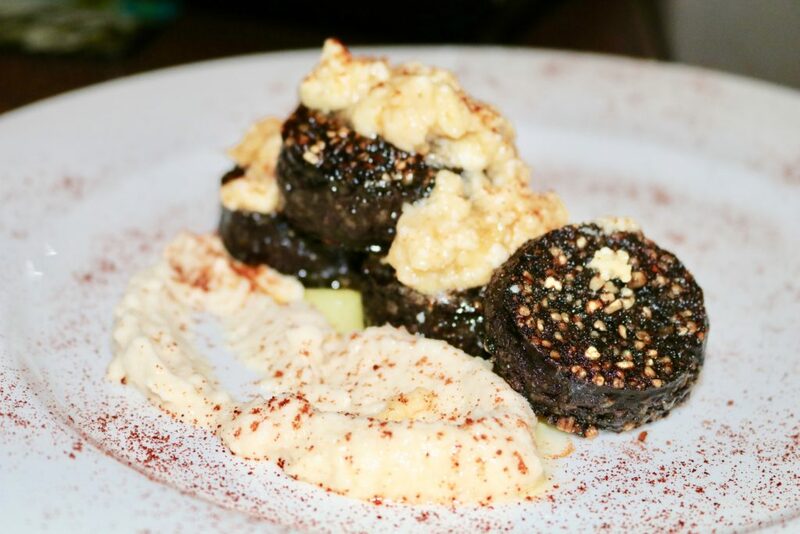 I’m loving the thought of this dish, Black Pudding with Coarse Cheese and Horseradish. But what went in to it – one plate wonder. In parallel, cube the cheese up and get that in a pan on the heat – yep it’s mini fondue time. Lowish heat and watch it melt. That it my friends. Plating time for Black Pudding with Coarse Cheese and Horseradish. Lay the puddings on top of each other, like in the photo. Spoon over the melted cheese. Dollop some horseradish, and to do Chef thing with back of spoon to make it look nice. From up high, sprinkle all over with some smoked paprika. Ta Da, finished. How good does that look! So there is guys a new wee recipe for you to try out. My Black Pudding with Coarse Cheese and Horseradish. Many thanks as always to the produce from The Cheese Shop, Joo Chiat, truly inspiring as always. This was stellar. What a great combination of ingredients. And also so very simple, I think you’ll agree. And it looks spanking! Everyone got in to this when I cooked it, even Baby Jude was giving thumbs up, and came back for seconds and thirds. Bloody nice dish. Try it. I guarantee you will – ENJOY!!! No Replies to "Black Pudding with Coarse Cheese and Horseradish"